Who says dressing up is just for humans? With the festivities around us, let them in to join the party. In this list, I will list the 10 best dog dresses that you and your pup will love. There are dresses for any occasion or just for the specific ones. Let your dog feel like a princess for the day. This grey and pink stripped outfit comes in many different sizes. It is form fitting at the chest area and loose layers of fabric around the back hips. The tutu base is grey-black with a pink ribbon edging. While the spider on it would make you think this is a Halloween costume, it can work in many different social situations. This item would be perfect for Valentine ’s Day or any day that the color red is appropriate. This has a white top with a red tutu skirt that would make anyone stand out in the crowd. This particular dress is sold by size – so you have to look for the size you want specifically. Another popular dress choice is for the cheerleader. This particular brand has many teams to choose from. This particular one is for the Dallas Cowboys. They come in multiple sizes to fit your dog. The colors and styles are based on the team you are looking for. This beautiful rose printed dress is the dress you can dress up and dress down depending on the occasion. 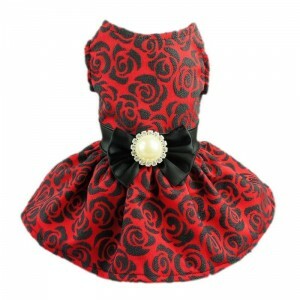 The dress is made of soft fabric that allows for your dog to feel comfortable and able to move. It comes in many different sizes. 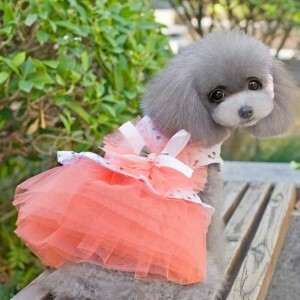 This is definitely one of the best dresses I have seen and worthy of the 10 Best Dog Dress list. You can’t have the winter holidays without the Santa dress. Here it is with sequins and white collars. You will know exactly where your dog is during the holiday season. This would be a good cold weather dress for the dog according to the website. This is the perfect dress for those holiday family photos that you will treasure for years to come. Whether you are in the middle of winter or the beginning of summer. This dress will warm your heart. It is made of a light pink fabric with matching bow and green sash. This color combination with your pup’s happy face will chase those April showers away. This also comes in multiple different colors and sizes. It is worthy of your dog’s spring dress collection. This dress is for the everyday gal that loves to various types of fashion. This has a denim bodice with a white skirt and a yellow sash. This comes in many different sizes and it is made of sturdy construction. It is perfect and worthy of the 10 Best Dog Dresses. 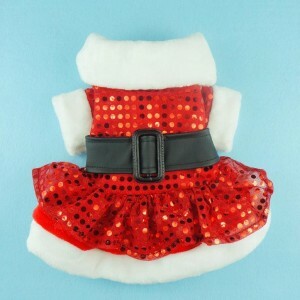 This is another Santa dress but this one is more for the everyday activities. It has white trim around the collar and skirt. But it also has a series of small white crisscrosses along the back of the dogs’ spine. This has many sizes available. So, let you pet have some fun in this more playful outfit. This dress is sold by the size but there are many available. This is a great idea to wear during the winter holidays. It is even something that your dog can wear for St. Patty’s day. 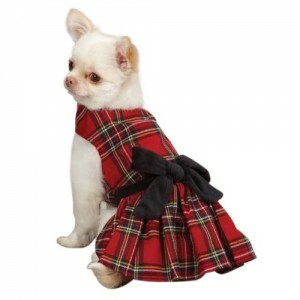 This is a bold plaid dress with its own sash. What is not to love? This is the lovely dress of summer. This has a white base with light blue pokadots. 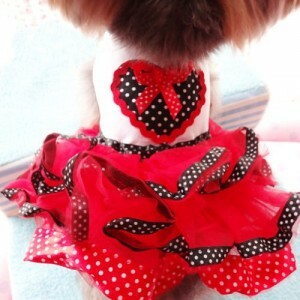 Your dog will love this dress. There are many sizes and colors available. It is worthy of being on the 10 Best Dog Dresses list. You don’t need to spend a lot of money on your dog’s dress collection – but gathering a wide variety of dresses will keep your pup grinning throughout the seasons. The 10 Best Dog Dresses lists several quality dresses that are for the special events in your family’s life. But we have also listed some dresses that could be used during the holiday season as a day dress. No matter where you and your dog go, you will be well dressed for any occasion.